Prestige + is a timeless modular collection that will adapt to your needs, over time. With its wide range of products, it is ideal for every type of office. 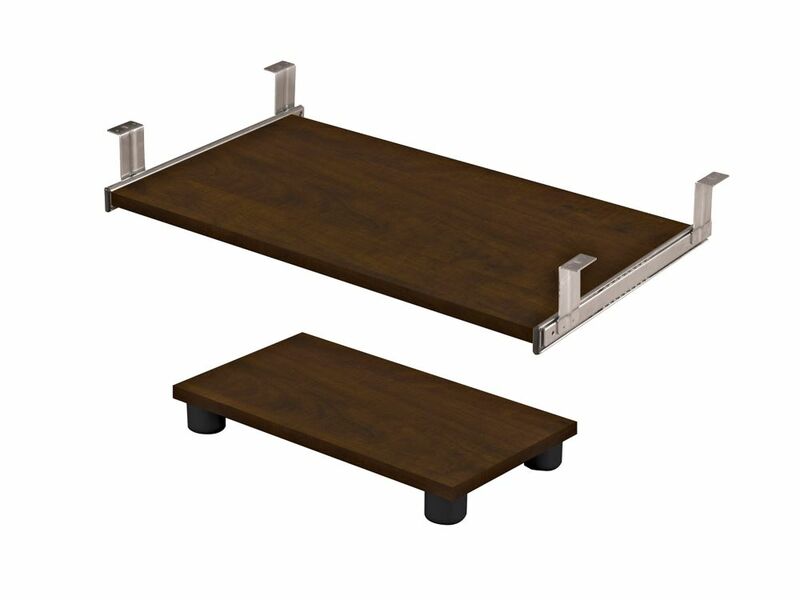 The keyboard shelf can be installed under executive desk, credenza, return table or bridge. Compliment your home with the Cascavel Stair Cubbies for all your storage needs. Its clean and sophisticated look will enhance any room environment. Perfect for storing books, trophies, electronic appliances, picture frames and collectables. The Cascavel Stair cubbies includes 6 square shelves and brackets to hang the unit onto your wall. Maximize your living space with the option to hang the unit on your wall or leave it free standing on the floor! Made of high quality MDP with beautiful color options. Perfect for your bedroom, living room, office, kid's room and classroom. Upon Assembly, each unit measures: 38.58 in. Height, 36.22 in. Length, 11.57 in. Depth. Available in White and Tobacco. i3 Plus by Bestar has been created to adapt to your living space with the flexibility of its configuration possibilities. Its sleek design is Intelligent, Inspiring and Innovative. Durable commercial grade top surface with melamine finish that resists scratches, stains and wear. It offers one file drawer with letter/legal filing system and two open storage compartments. Drawer on ball-bearing slides for smooth and quiet operation. Drawer is lockable. Meets or exceeds ANSI/BIFMA performance standards. Pro-Linea has all the elements to create a modern and refined work environment. The clean lines of this collection bring a fresh look without compromising functionality and durability. Fully assembled, the lateral file offers metal legs and two file drawers with letter/legal filing system. This unit meets or exceeds ANSI/BIFMA performance standards. Finished back. Prestige + keyboard shelf and CPU platform in Chocolate Prestige + is a timeless modular collection that will adapt to your needs, over time. With its wide range of products, it is ideal for every type of office.